S. v. immanis under the single species S. vachoni, but they encourage future taxonomic investigations using more rigorous species delimitation approaches. I refer to the abstract and the article for further details. 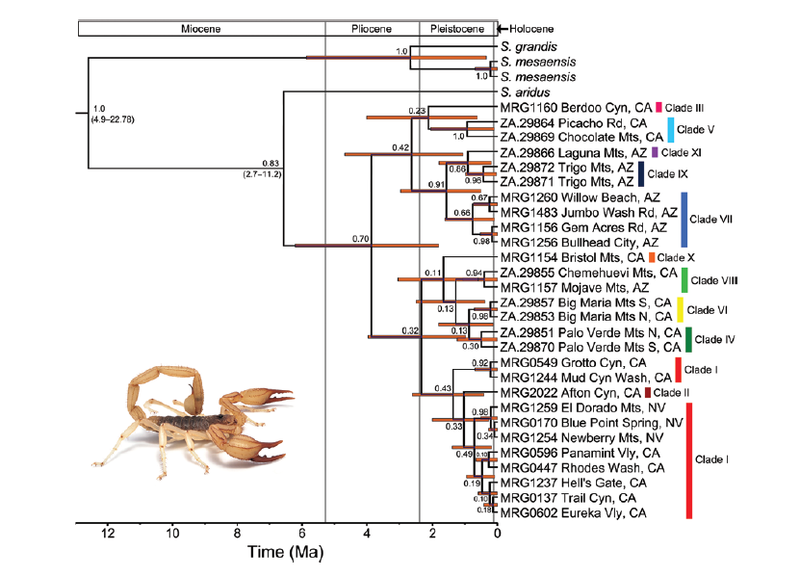 Recent syntheses of phylogeographical data from terrestrial animals in the Mojave and Sonoran deserts have revealed a complex history of geologic and climatic vicariance events. 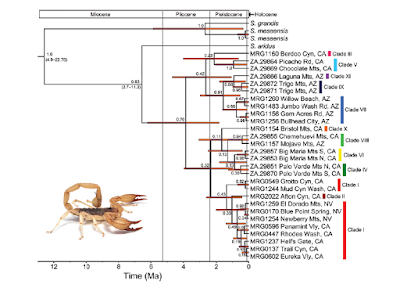 We studied the phylogeography of Smeringurus vachoni to see how vicariance events may have impacted a large, endemic rock scorpion. Additionally, we used the phylogeographical data to examine the validity of two subspecies of S. vachoni that were described using unconventional morphological characters. Phylogenetic, network and SAMOVA analyses indicate that S. vachoni consists of 11 clades mostly endemic to isolated desert mountain ranges. Molecular clock estimates suggest that clades diversified between the Miocene and early Pleistocene. Species distribution models predict a contraction of suitable habitat during the last glacial maximum. Landscape interpolations and Migrate-n analyses highlight areas of gene flow across the Colorado River. Smeringurus vachoni does not comprise two subspecies. Instead, the species represents at least 11 mitochondrial clades that probably diversified by vicariance associated with Pleistocene climate changes and formation of ancient lakes along the Colorado River corridor. Gene flow appears to have occurred from west to east across the Colorado River during periodic river avulsions.